Hi, how exactly do you calculate Sr? I read your definition of it several times but still clues. Please let me know. Thanks. So, what does “significant decrease” mean? Is it statistical significance test? Or you just set a threshold, say 0.001, and choose the order when the change in the Sr(m)/(n-m-1) drops below this threshold? Could you help me out on this issue? There is no rule of thumb that I know of. If there is a minimum at a low order of polynomial, that is an indication of the optimum polynomial as well. If there is any threshold, it should be a relative number. I am working to find an algorithmic/automatic way of predicting the order of the polynomial. But with not much luck! However I found ways to predict the order of the polynomial and accept that it can overestimate the true order… it can do that with 83% accuracy. This is very nice technique, but I cannot understand the meaning of the denominator ‘n-m-1’. Hi, this is good article. However I cannot understand the meaning of (n-m-1). Also, is there any reference of this article? Yes, it is weighting. If n=m+1, then Sr=0. So it weights reduction is Sr and increase in polynomial order. Hi, thank you for this informative article. However, I don’t understand why n-m-1 is used as the denominator instead of n-1. Rewrite n-m-1 as n-(m+1). The numerator is Sr for a polynomial of order m. So when n=m+1, then Sr=0. So as m increases, Sr, and n-(m+1) both decrease. And since we want something that is optimum, we give them equal weight. Plot n-m-1 vs m and Sr vs m separately to see what happens. Why would I want to provide equal weightage to n-m-1? Isn’t the Sr satisfactory enough? If Sr is given all the weight, then the optimum order of polynomial m is n-1. 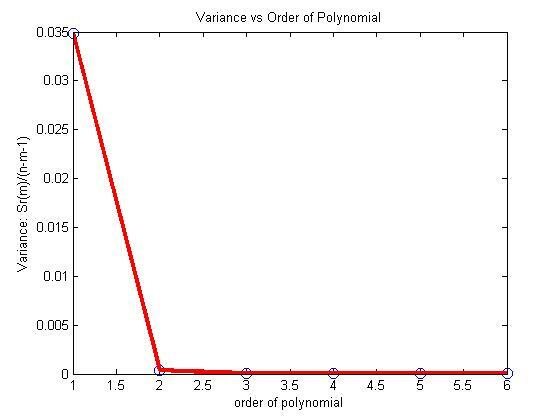 This is the case where the polynomial goes through all the data points and Sr=0. But regression is all about finding a simplified curve to represent the data.